The 2017 Chevrolet Corvette Grand Sport embodies all the great features of the original 1963 version with power, grip and immense handling. The 2017 version being the best yet. The 2017 model comes with a 6.2 L V8 engine with 460Hp and 460lbs. ft. of torque, coupled to either an eight speed automatic transmission some speed manual. This gives a 0 – 60 mph time of 3.9 seconds and the starting price of $66,445. Additional upgrades include a 2LT package, a Performance Data Recorder for $1785, $995 for racing stripes, $100 for Carbon Flash badging, $495 for black wheels and $795 for the Heritage package which includes interior and fender hash marks and floor mats. 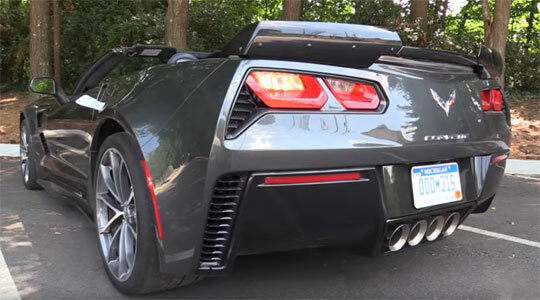 The video goes through the complete vehicle, giving you the low-down on why this 2017 model is possibly the best Corvette up to now. If you want to jump ahead through the video, the list of time stamps are listed below.